It might seem obvious to others but I have never been quite sure what Mid-Century Modernism was actually meant to cover. To my mind it’s an attempt to both catch a period (ca. 1940 – 1980) as well as a way to both engage and view the origins of our contemporary culture. After 60 short years of rapid technological, societal and cultural change I find it quite fascinating to see that it has now attempted to shape a canon — of High Modernism — and to set out a defined period of climax and activity. Along side this canon there have also been attempts to characterize and give demarcation to Mid-Centuryism with corresponding periods and concepts: Streamline Modernism, Post Modernism — cutely colloquial as PoMo; Pseudo Modernism; Ikea Modernism and even Bad and No Modernism. I’m for all of the above, if only because the two great North American architects Mies van der Rohe of “less is more” and Morris Lapidus “less is nothing” were bi-polar contemporaries and fit more closely with my vision of a Mid-Century Mad Men Modernism. My Mid-Century Modernism when it comes to Canadian pottery and design encompasses these various factions and facets, partially because I think we are 1) mid-stream in forming a terminology that adequately characterizes the robustness and diversity of the larger period and 2) because we are still formatting a scholarship and connoisseurship that supports and informs our reasoning. I include design as a handle to Canadian Studio Pottery and use pottery as a construct and contrast to ceramic(s) in my approach to Mid-Century Modern, in good part because of the above reasons. I’ll have more to say about this in later posts. To pick up this bare bones foray into Modernism redux, is, however, to go back to a couple of pieces by potter Bob Bozak. As I posted them, they caused me to think a bit about the scope of a person’s career, the challenge of interpretation, the definition of Modernism and the complexity of description. You can see the pieces under my Gallery sections. Though he is often thought of as a fine artist Bozak’s career has always included pottery. 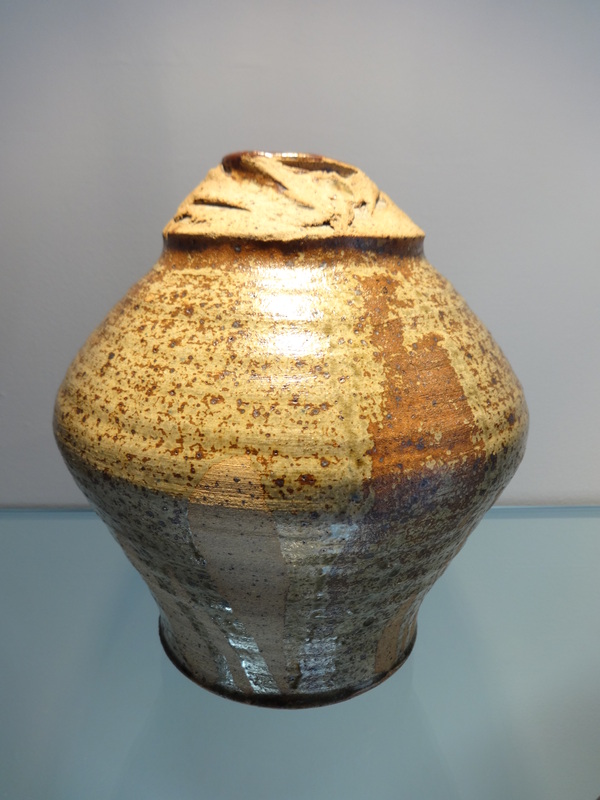 The large stoneware vase with ash glaze is from his years at the Alberta College of Art (1964-67) when he first started exhibiting across Canada. You would certainly be tempted to pick it out as a Voulkos Era piece — to use the Ebay listing term of choice. Two smaller pieces are his ash tray and handled bowl from his pottery business of 1970 -1986 which was run with spouse Dawn Bozak (Johnston). He typically did the line work and glazing — in this case white ash glaze and brushed iron slip. Technically difficult and with an aesthetic acknowledgement of Canada’s Western Ontario rural, country lifestyle — informal shape, simple line, practical robust stoneware. Work from the 1990’s includes three plates and a coffee mug. They beautifully illustrate his expertise in glazing and form — muscular, angular, use of line as definition — in addition to referencing Japanese pottery and Modernist architecture. If you have insight into his work I’ll be happy to have it shared and discussed.